My mom and I decided to give mango ice cream a try. The great thing about making ice cream, apart from the obvious delicious benefits, is that if you learn to make one, you can make them all. Ice cream, gelato, sherbet, sorbet are all essentially the same thing, they just vary in the amount of cream, milk, and sugar in each. Sorbet is the absence of cream and milk (ice crystals). Sherbet has a very low amount of cream in it, and gelato has a lower percentage of fat and sugar than regular ice cream. For myself, I think my favorite part of the whole process is the churning of the ice cream custard, or rather watching our ice cream maker churn it. 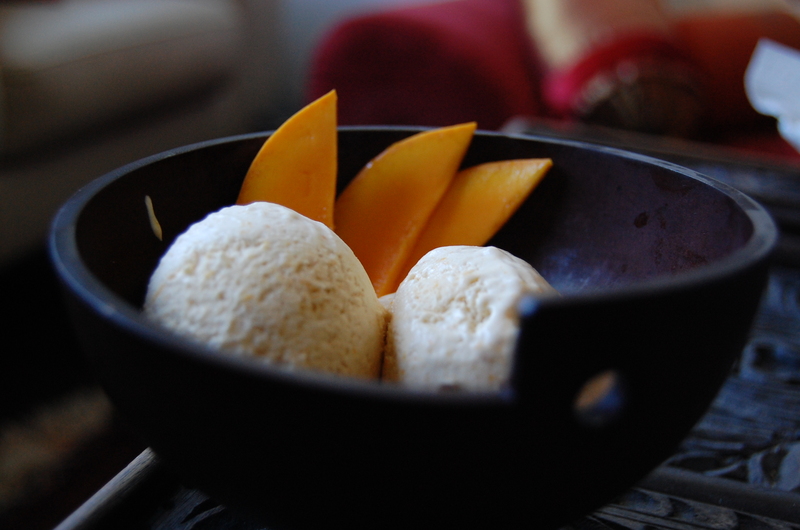 1 – Mix the mango, 1/4 cup of the sugar and the corn syrup in a saucepan on medium heat. Stir until the sugar melts and the mangos soften from being heated through. Pour the mixture into a large bowl. 2 – Puree or blend the mixture and use a spatula or wooden spoon to work the mango mixture through a seive and set the mixture it aside. 3 – Bring the half-and-half cream to a simmer over medium-high heat in a saucepan, then remove it from the heat. 4 – Whisk the egg yolks and the remaining 1/4 cup sugar in a metal bowl until it’s blended. 5 – Gradually pour the hot cream mixture into the yolk mixture while you whisk it. 6 – Put the full mixture back into the saucepan over medium-low heat. Keep stirring the mixture with a wooden spoon until it turns thickens to the point where it easily coats the back of your spoon. This is your ice cream custard. It’s important not to let the custard to boil. 7 – Pour the custard through a fine-mesh sieve into the mango mixture. 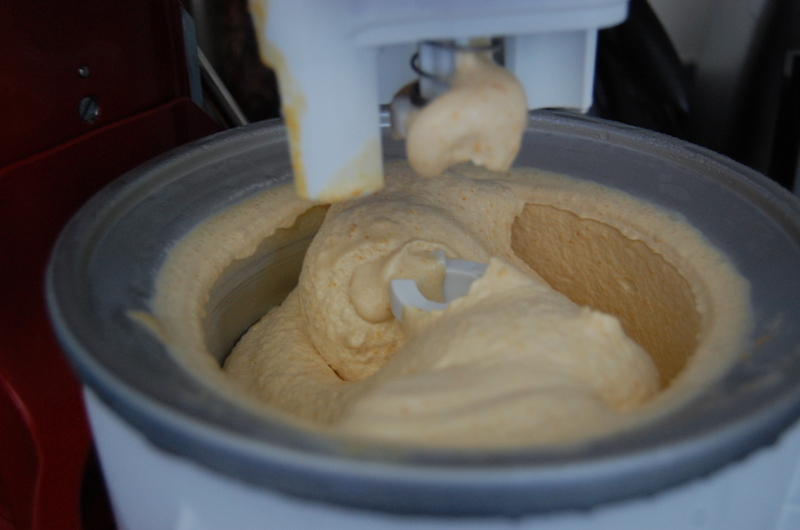 8 – Set-up your ice cream maker and follow the manufacturer’s instructions on churning the custard into ice cream. 9 – Scoop out the ice cream into a freezer-safe container and freeze it until it’s firm. After the ice cream custard was finished and chilling, we were feeling ambitious; particularly as we realized we still had all the egg whites left over from making the ice cream. Knowing myself, if I didn’t use up the egg whites immediately, I never would and we didn’t want to waste the whites. Lemon meringue pie was the first thing that came to mind that would be a great use of egg whites, which would also be a fabulous summer dessert. However, rather than making the traditional lemon meringue, we decided to change it up a little and swap out the lemons for oranges. The result was outstanding. The oranges still give the pie a strong refreshing, citrus flavor with a little less tang than the lemons. If you have the chance, give it a try. All we need to think about now is what’s for dinner. This entry was posted in Desserts and tagged desserts, food, foodie, home, ice cream, mango, meringue, orange, pie, summer, Toronto. Bookmark the permalink. Thanks a million. It is cool reading.